A worsening crisis over waste in Naples has led to serious health warnings but attempts to ease the problem are being hampered by the local mafia. Where there is muck, there is brass. And in Italy, where there is brass - there is mafia. 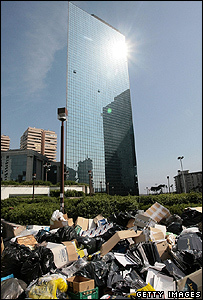 The Camorra, the Neapolitan version of the mob, has infiltrated every part of the rubbish collection industry and it is raking in huge profits. As for the government, it has spent millions on emergency programmes designed to clean up the rubbish that in recent weeks has piled up in the streets of Naples. Yet, despite the huge investment, the crisis rears up again each year, like a nasty perennial weed. In the suburb of Pianura, the rubbish is piled up three metres high, opposite the doorway of a creche. The owner, Sonia Tuppo, burns incense in her nursery, but it does little to mask the odour. Parents clamber over bin bags just to get through the door, their children holding their noses. There are flies and rats, and in the hot weather of recent weeks, the filthy smell has just got worse. Now almost half of the mothers, whose children usually use the creche, keep their little ones away. In the nearby district of San Giorgio a Cremano, they are demonstrating and handing out leaflets. "We will all die of cholera," they shout. The doctors confirm that diseases more commonly found in developing countries are now appearing here in Naples. No wonder many tourists are now choosing to stay away. The ones who do come to see the ruins of Pompeii, a city once buried under ash, leave by roads buried today under festering waste. This year the crisis is worse than ever because there is nowhere, officially, to put the rubbish. The dumps, operated by the local government, have been overflowing. The authorities are so overwhelmed that in the past few weeks they have opened dumps that have long since been closed and they have also been moving the waste to Germany. Gianfranco Nappi, who sits on an emergency commission, tells me the region of Campania, which has a population of six million people, now has just one official rubbish dump left in Villa Ricca. It, too, is almost full. He says they have plans to ease the crisis by building incinerators, but he says the mafia, keen to keep up its own profitable rubbish operation, is trying to block them, as well as the schemes for new official dump sites and refuse treatment centres. Mr Nappi tells me that land targeted by the commission for new dumps or incinerators has been bought up by the mafia's illicit companies. Businessmen and politicians are intimidated, he says, while the Camorra continues to operate its own illegal sites that rake in those profits. Here in southern Italy, there is a pernicious connection between mafia and state, which successive governments have been unable to break. And in the absence of proper checks and controls, the environmental impact just gets worse. On the outskirts of Naples, we are taken by the Italian environmental group Legambiente, to a council dump the size of 300 football fields. It is hidden from the road and it is patrolled by private security teams who do not like cameras. They try to stop us filming the lorries, which arrive every day carrying bails of compressed rubbish. These are bails that should have been burnt for fuel. But the solid and liquid waste within them has apparently not been properly separated. 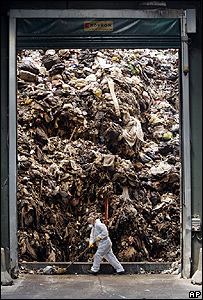 So all five million tonnes of this processed rubbish will have to be processed again. For the time being, the bails lie hidden under black tarpaulin, leaking their dangerous dioxins into the fields of nearby apricot farms. Legambiente says it is just the tip of the iceberg. In the last year it has identified more than 100 illegal dumping sites around Campania, which contain much more dangerous toxic industrial waste. The mafia is collecting it from factories all over Italy, as well as from other parts of Europe, undercutting the legitimate disposal companies. They promise to treat the waste at knock-down prices, but in reality they bury it or burn it in the countryside outside Naples. In some areas, the level of toxicity in the soil is 100,000 times the normal safety standards. And in the past few weeks, the devastating effect on public health has now started to emerge. Professor Giuseppe Comella, from the Pascale Cancer Institute in Naples, told me they have now discovered an indisputable link between the dumping of waste and the increase of cancers in the Campania region. It may be up to 20 years before the full effect can be measured but today the courts revealed that compared with the national average, people in these polluted regions of Campania are now four times more likely to contract cancers. And there is an 83% higher risk of deformed babies being born. The government is promising tough legislation to deal with the problem with hefty prison sentences for those who dump illegally. But people here are well aware that, so far, every new initiative to destroy the mafia has ended in abject failure. And no-one is in any doubt that when these mountains of rubbish are all eventually cleared, the stench of corruption will remain. From Our Own Correspondent was broadcast on Thursday, 7 June 2007 at 1100 BST on BBC Radio 4. Please check the programme schedules for World Service transmission times.